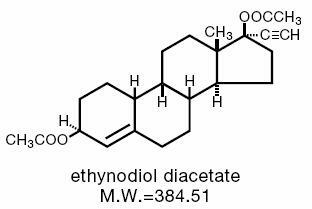 The chemical name for ethynodiol diacetate is 19-Nor-17Î±-pregn-4-en-20-yne-3Î²,17-diol diacetate, and for ethinyl estradiol it is 19-Nor-17Î±-pregna-1,3,5(10)-trien-20-yne-3, 17-diol. One study67 gathered data from a variety of sources that have estimated the mortality rates associated with different methods of contraception at different ages (Table 2). These estimates include the combined risk of death associated with contraceptive methods plus the risk attributable to pregnancy in the event of method failure. Each method of contraception has its specific benefits and risks. The study concluded that, with the exception of oral contraceptive users 35 and older who smoke and 40 or older who do not smoke, mortality associated with all methods of birth control is low and below that associated with childbirth. The observation of a possible increase in risk of mortality with age for oral contraceptive users is based on data gathered in the 1970â€™s, but not reported until 1983.67 However, current clinical practice involves the use of lower estrogen dose formulations combined with careful restriction of oral contraceptive use to women who do not have the various risk factors listed in this labeling. 1. Hatcher RA, et al. Contraceptive Technology: Seventeenth Revised Edition. New York, NY, 1998. 1a.Physiciansâ€™ Desk Reference. 47th ed. Oradell, NJ: Medical Economics Co Inc; 1993;2598-2601. 2. Mann JI, et al. Br Med J. 1975; 2 (May 3):241. 3. Mann JI, et al. Br Med J. 1975;3(Sept 13):631. 4. Mann JI, et al. Br Med J. 1975;2(May 3):245. 5. Mann JI, et al. Br Med J. 1976;2(Aug 21):445. 6. Arthes FG, et al. Chest. 1976;70 (Nov):574. 7. Jain AK, Am J Obstet Gynecol. 1976;301(Oct 1):126 and Stud Fam Plann. 1977;8(March):50. 8. Ory HW. JAMA. 1977;237(June 13):2619. 9. Jick H, et al. JAMA. 1978;239(April 3):1403, 1407. 10. Jick H, et al. JAMA. 1978;240(Dec 1):2548. 11. Shapiro S, et al. Lancet. 1979;1(April 7):743. 12. Rosenberg L, et al. Am J Epidemiol. 1980;111(Jan):59. 13. Krueger DE, et al. Am J Epidemiol. 1980;111 (June):655. 14. Layde P, et al. Lancet. 1981;1(March 7):541. 15. Adam SA, et al. Br J Obstet Gynaecol. 1981;88(Aug):838. 16. Slone D, et al. N Engl J Med. 1981;305 (Aug 20):420. 17. Ramcharan S, et al. The Walnut Creek Contraceptive Drug Study. Vol 3. US Govt Ptg Off. 1981; and J Reprod Med. 1980;25(Dec):346. 18. Layde PM, et al. J R Coll Gen Pract. 1983;33(Feb):75. 19. Rosenberg L, et al. JAMA. 1985;253(May 24/31):2965. 20. Mant D, et al. J Epidemiol Community Health. 1987;41 (Sept):215. 21. Croft P, et al. Br Med J. 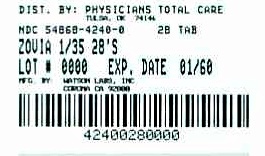 1989;298 (Jan 21):165. 22. Goldbaum GM, et al. JAMA. 1987;258(Sept 11):1339. 23. Bradley DD, et al. N Engl J Med. 1978;299(July 6):17. 24. Tikkanen MJ. J Reprod Med. 1986;31(Sept suppl):898. 25. Lipson A, et al. Contraception. 1986;34(Aug):121. 26. Burkman RT, et al. Obstet Gynecol. 1988; 71(Jan):33. 27. Knopp RH, J Reprod Med. 1986;31(Sept Suppl):913. 28. Krauss RM, et al. Am J Obstet Gynecol. 1983;145(Feb 15):446. 29. Wahl P, et al. N Engl J Med. 1983;308(April 14):862. 30.Wynn V, et al. Am J Obstet Gynecol. 1982;142(March 15):766. 31. LaRosa JC. J Reprod Med. 1986;31(Sept suppl):906. 32. Wynn V, et al. J Reprod Med. 1986;31(Sept Suppl):892. 33. Royal College of General Practitioners. J R Coll Gen Pract. 1967;13(May):267. 34. Inman WHW, et al. Br Med J. 1968;2(April 27):193. 35. Vessey MP, et al. Br Med J. 1968;2(April 27):199. 36. Vessey MP, et al. Br Med J. 1969;2(June 14):651. 37. Sartwell PE, et al. Am J Epidemiol. 1969;90(Nov):365. 38. Vessey MP, et al. Br Med J. 1970;3(July 18):123. 39. Greene GR, et al. Am J Public Health. 1972;62(May):680. 40. Boston Collaborative Drug Surveillance Programme. Lancet. 1973;1(June 23):1399. 41. Stolley PD, et al. Am J Epidemiol. 1975;102(Sept):197. 42. Vessey MP, et al. J Biosoc Sci. 1976;8(Oct):373. 43. Kay CR, J R Coll Gen Pract. 1978;28(July):393. 44. Petitti DB, et al. Am J Epidemiol. 1978;108 (Dec):480. 45. Maquire MG, et al. Am J Epidemiol. 1979;110(Aug):188. 46. Petitti DB, et al. JAMA. 1979;242(Sept 14):1150. 47. Porter JB, et al. Obstet Gynecol. 1982;59(March):299. 48. Porter JB, et al. Obstet Gynecol. 1985;66(July):1. 49. Vessey MP, et al. Br Med J. 1986;292(Feb 22):526. 50. Hoover R, et al. Am J Public Health. 1978;68(April):335. 51. Vessey MP, Br J Fam Plann. 1980;6(Oct suppl):1. 52. Collaborative Group for the Study of Stroke in Young Women. N Engl J Med. 1973;288(April 26):871. 53. Royal College of General Practitioners. Oral Contraceptives and Health. New York, NY: Pitman Publ Corp; May 1974. 54. Collaborative Group for the Study of Stroke in Young Women. JAMA. 1975;231(Feb 17):718. 55. Beral V. Lancet. 1976;2(Nov 13):1047. 56. Vessey MP, et al. Lancet. 1977;2(Oct 8):731; and 1981;1(March 7):549. 57. Petitti DB, et al. Lancet. 1978;2(July 29):234. 58. Inman WHW. Br Med J. 1979;2(Dec 8):1468. 59. Vessey MP, et al. Br Med J. 1984; 289(Sept 1):530. 60. Inman WHW, et al. Br Med J. 1970;2(April 25):203. 61. Meade TW, et al. Br Med J. 1980;280(May 10):1157. 62. Böttiger LE, et al. Lancet. 1980;1(May 24):1097. 63. Kay CR. Am J Obstet Gynecol. 1982;142(March 15):762. 64. Vessey MP, et al. Br Med J. 1986;292(Feb 22):526. 65. Gordon T, et al. Am J Med. 1977;62(May):707. 66. Beral V, et al. Lancet. 1977;2(Oct 8):727. 67. Ory H. Fam Plann Perspect. 1983;15(March-April):57. 68. Arthes FG, et al. Cancer. 1971;28 (Dec):1391. 69. Vessey MP, et al. Br Med J. 1972;3(Sept 23):719. 70. Boston Collaborative Drug Surveillance Program. N Engl J Med. 1974;290(Jan 3):15. 71. Vessey MP, et al. Lancet. 1975;1(April 26):941. 72. Casagrande J, et al. J Natl Cancer Inst. 1976;56(April):839. 73. Kelsey, JL, et al. Am J Epidemiol. 1978;107(March):236. 74. Kay CR, Br Med J. 1981;282(June 27):2089. 75. Vessey MP, et al. Br Med J. 1981;282(June 27):2093. 76. The Cancer and Steroid Hormone Study of the Centers for Disease Control and the National Institute of Child Health and Human Development. Oral contraceptive use and the risk of breast cancer. N Engl J Med. 1986;315(Aug 14):405. 77. Paul C, et al. Br Med J. 1986; 293 (Sept 20):723. 78. Miller DR, et al. Obstet Gynecol. 1986;68(Dec):863. 79. Pike MC, et al. Lancet. 1983;2(Oct 22):926. 80. McPherson K, et al. Br J Cancer. 1987;56(Nov):653. 81. Hoover R, et al. N Engl J Med. 1976;295(Aug 19):401. 82. Lees AW, et al. Int J Cancer. 1978;22(Dec):700. 83. Brinton LA, et al. J Natl Cancer Inst. 1979;62(Jan):37. 84. Black MM. Pathol Res Pract. 1980;166:491; and Cancer. 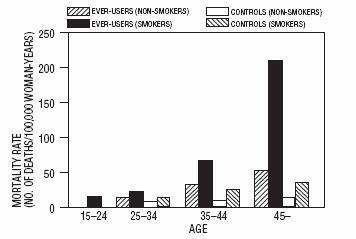 1980;46(Dec):2747; and Cancer. 1983;51(June):2147. 85. Thomas DB. JNCI. 1993;85 (March 3):359. 86. Brinton LA, et al. Int J Epidemiol. 1982;11(Dec):316. 87. Harris NV, et al. Am J Epidemiol. 1982;116(Oct):643. 88. Jick H, et al. Am J Epidemiol. 1980;112(Nov):577. 89. McPherson K, et al. Lancet. 1983;2(Dec 17):1414. 90. Hoover R, et al. J Natl Cancer Inst. 1981; 67(Oct):815. 91. Jick H, et al. Am J Epidemiol. 1980; 112(Nov):586. 92. Meirik O, et al. Lancet. 1986;2 (Sept 20):650. 93. Fasal E, et al. J Natl Cancer Inst. 1975;55(Oct):767. 94. Paffenbarger RS, et al. Cancer. 1977;39(April suppl):1887. 95. Stadel BV, et al. Contraception. 1988;38(Sept):287. 96. Miller DR, et al. Am J Epidemiol. 1989;129(Feb):269. 97. Kay CR, et al. Br J Cancer. 1988;58(Nov):675. 98. Miller DR, et al. Obstet Gynecol. 1986;68(Dec):863. 99. Hulka BS, et al. Cancer. 1994;74(August 1 suppl):1111. 100. Chilver CED, et al. Br J Cancer. 1994;67(May):922. 101. Huggins GR, et al. Fertil Steril. 1987;47(May):733. 102. Pike MC, et al. Br J Cancer. 1981;43(Jan):72. 103. Ory H, et al. Am J Obstet Gynecol. 1976;124(March 15):573. 104. Stern E, et al. Science. 1977;196(June 24):1460. 105. Pertiz E, et al. Am J Epidemiol. 1977;106(Dec):462. 106. Ory HW, et al. In: Garattini S, Berendes H, eds. Pharmacology of Steroid Contraceptive Drugs. New York, NY: Raven Press; 1977:211-224. 107. Meisels A, et al. Cancer. 1977;40(Dec):3076. 108. Goldacre MJ, et al. Br Med J. 1978;1(March 25):748. 109. Swan SH, et al. Am J Obstet Gynecol. 1981;139(Jan 1):52. 110. Vessey MP, et al. Lancet. 1983;2(Oct 22):930. 111. Dallenbach-Hellweg G. Pathol Res Pract. 1984;179:38. 112. Thomas DB, et al. Br Med J. 1985;290(March 30):961. 113. Brinton LA, et al. Int J Cancer. 1986;38(Sept):339. 114. Ebeling K, et al. Int J Cancer. 1987;39(April):427. 115. Beral V, et al. Lancet. 1988;2(Dec 10):1331. 116. Baum JK, et al. Lancet. 1973;2(Oct 27):926. 117. Edmondson HA, et al. N Engl J Med. 1976;294(Feb 26):470. 118. Bein NN, et al. Br J Surg. 1977;64(June):433. 119. Klatskin G. Gastroenterology. 1977;73(Aug):386. 120. Rooks JB, et al. JAMA. 1979;242(Aug 17):644. 121. Sturtevant FM. In: Moghissi K, ed. Controversies in Contraception, Baltimore, MD; Williams & Wilkins; 1979:93-150. 122. Henderson BE, et al. Br J Cancer. 1983;48(July):437. 123. Neuberger J, et al. Br Med J. 1986;292(May 24):1355. 124. Forman D, et al. Br Med J. 1986;292(May 24):1357. 125. La Vecchia C, et al. Br J Cancer. 1989;59(March):460. 126. Savolainen E, et al. Am J Obstet Gynecol 1981;140(July 1):521. 127. Ferencz C, et al. Teratology. 1980;21(April):225. 128. Rothman KJ, et al. Am J Epidemiol. 1979;109(April):433. 129. Harlap S, et al. Obstet Gynecol. 1980;55(April):447.130. Layde PM, et al. J Epidemiol Community Health. 1982;36(Dec):274. 131. Rome Group for the Epidemiology and Prevention of Cholelithiasis (GREPCO). Am J Epidemiol. 1984;119(May):796. 132. Strom BL, et al. Clin Pharmacol Ther. 1986;39(March):335. 133. Wynn V. In: Bardin CE, et al, eds. Progesterone and Progestins. New York, NY: Raven Press; 1983:395-410. 134. Perlman JA, et al. J Chron Dis. 1985;38(Oct):857. 135. Powell MG, et al. Obstet Gynecol. 1984;63(June):764. 136. Wynn V, et al. Lancet. 1966;2(Oct 1):720. 137. Fisch IR, et al. JAMA. 1977;237(June 6):2499. 138. Kay CR. Lancet. 1977;1(March 19):624. 139. Laragh JH. Am J Obstet Gynecol. 1976;126(Sept 1):141. 140. Ramcharan S. In: Garattini S, Berendes HW, eds. Pharmacology of Steroid Contraceptive Drugs. New York, NY: Raven Press; 1977:277-288. 141. Laumas KR, et al. Am J Obstet Gynecol. 1967;98(June 1):411. 142. Saxena BN, et al. Contraception. 1977;16(Dec):605. 143. Nilsson S, et al. Contraception. 1978;17(Feb):131. 144. Washington AE, et al. JAMA. 1985;253(April 19):2246. 145. Louv WC, et al. Am J Obstet Gynecol. 1989;160(Feb):396. 146. Francis WG, et al. Can Med Assoc J. 1965;92(Jan 23):191. 147. Verhulst HL, et al. J Clin Pharmacol. 1967:7(Jan-Feb):9. 148. Ory HW, Fam Plann Perspect. 1982;14(July-Aug):182. 149. Ory HW, et al. Making Choices: Evaluating the Health Risks and Benefits of Birth Control Methods. New York, NY: The Alan Guttmacher Institute; 1983. 150. Palmer JR, et al. Am J Epidemiol. 1989;130(Nov):878. 151. Romieu I, et al. J Natl Cancer Inst. 1989;81(Sept):1313. 152. Porter JB, et al. Obstet Gynecol. 1987;70(July):29. 153. Olsson H, et al. Cancer Detect Prev. 1991;15:265. 154. Delgado-Rodriguez M, et al. Rev Epidém Santé Publ. 1991;39:165. 155. Clavel F, et al. Int J Epidemiol. 1991;20(March):32. 156. Brinton LA, et al. JNCI. 1995;87(June 7):827. 157. Thomas DB, et al. Br J Cancer. 1992;65(January):108. 158. Thomas DB, et al. Cancer Causes Cont. 1991;2(Nov):389. 159. Weinstein AL, et al. Epidemiology. 1991;2(Sept):353. 160. Ranstam J, et al. Anticancer Res. 1991;11(Nov-Dec):2043. 161. Ursin G. et al. Epidemiology. 1992;3(Sept):414. 162. White E, et al. JNCI. 1994;86(April 6):505. 163. Mann R, et al. Oral contraceptives and Breast Cancer. Park Ridge, NJ: The Parthenon Publishing Group Inc.; 1990. 164. Institute of Medicine. Committee on the Relationship Between Oral Contraceptives and Breast Cancer. Oral Contraceptives and Breast Cancer. Washington, DC: National Academy Press; 1991. 165. Harlap S. J Reprod Med. 1991;36(May):374. 166. Rushton L, et al. Br J Obstet Gynaecol. 1992;99(March):239. 167. Colditz G. Cancer. 1993;71(Feb 15 suppl):1480. In the detailed leaflet, â€œWhat You Should Know About Oral Contraceptives,â€ which you have received, the risks and benefits of oral contraceptives are discussed in much more detail. That leaflet also provides information on other forms of contraception. Please take time to read it carefully for it may have been recently revised. Oral contraceptives, also known as â€œbirth control pillsâ€ or â€œthe pill,â€ are taken to prevent pregnancy and, when taken correctly, have a failure rate of about 1% per year when used without missing any pills. The typical failure rate of large numbers of pill users is less than 3% per year when women who miss pills are included. However, forgetting to take pills considerably increases the chances of pregnancy. It is important that any woman who considers using an oral contraceptive understand the risks involved. Although the oral contraceptives have important advantages over other methods of contraception, they have certain risks that no other method has. Only you and your physician can decide whether the advantages are worth these risks. This leaflet will tell you about the most important risks. It will explain how you can help your doctor prescribe the pill as safely as possible by telling him/her about yourself and being alert for the earliest signs of trouble. And it will tell you how to use the pill properly so that it will be as effective as possible. THERE IS MORE DETAILED INFORMATION AVAILABLE IN THE LEAFLET PREPARED FOR DOCTORS. 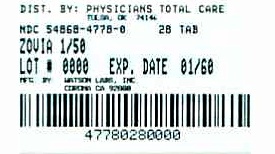 Your pharmacist can show you a copy; you may need your doctorâ€™s help in understanding parts of it. This leaflet is not a replacement for a careful discussion between you and your health care provider. You should discuss the information provided in this leaflet with him or her, both when you first start taking the pill and during your revisits. You should also follow your health care providerâ€™s advice with regard to regular check-ups while you are on the pill. The most common type of oral contraceptive, often simply called â€œthe pill,â€ is a combination of estrogen and progestogen, the two kinds of female hormones. 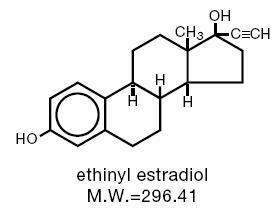 The amount of estrogen and progestogen can vary, but the amount of estrogen is more important because both the effectiveness and some of the dangers of the pill have been related to the amount of estrogen. 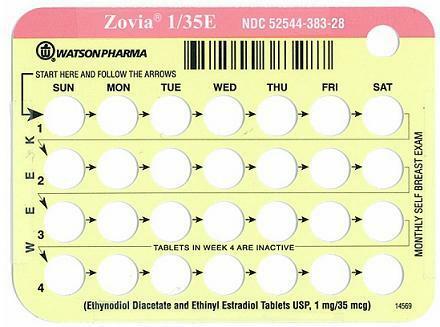 The pill works principally by preventing release of an egg from the ovary during the cycle in which the pills are taken. The suggestion that women over 40 who donâ€™t smoke should not take oral contraceptives is based on information from older high-dose pills and on less selective use of pills than is practiced today. An Advisory Committee of the FDA discussed this issue in 1989 and recommended that the benefits of oral contraceptive use by healthy, nonsmoking women over 40 years of age may outweigh the possible risks. However, all women, especially older women, are cautioned to use the lowest dose pill that is effective. If you feel sick to your stomach, do not stop taking the pill. The problem will usually go away. If it doesnâ€™t go away, check with your doctor or clinic. The 28-pill pack has 21 â€œactiveâ€ pills (with hormones- light pink or pink) to take for 3 weeks, followed by 1 week of reminder white pills (without hormones). To remove a pill press down on it with the flat of your finger. The pill will drop through a hole in the bottom of the dispenser. Begin the 28-pill pack with the first pill in Row 1 and continue (â†’) across Row 1 (Week 1). Repeat for Row 2, Row 3, and finally Row 4. 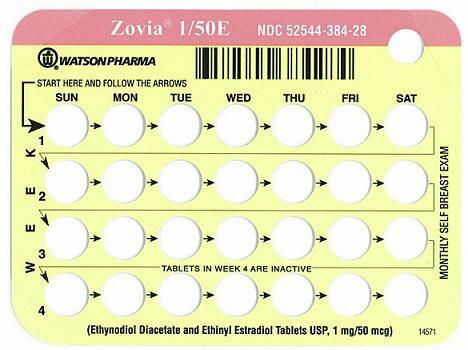 Take all â€œactiveâ€ pills (light pink or pink) before starting Row 4. Take the first â€œactiveâ€ pill (light pink or pink) of the first pack during the first 24 hours of your period. 1. Take the first â€œactiveâ€ pill (light pink or pink) of the first pack on the Sunday after your period starts, even if you are still bleeding. If your period begins on Sunday, start the pack that same day. WHEN YOU FINISH A PACK OR SWITCH YOUR BRAND OF 28-DAY PILLS: Start the next pack on the day after your last â€œreminderâ€ pill. Do not wait any days between 28-day packs.